Question: How can I change the appearance of the clock sidebar gadget in Windows Vista? Answer: You can change the look and feel (appearance) of the sidebar clock in Windows Vista by clicking on the little tool button that appears when you place your mouse on the clock gadget. 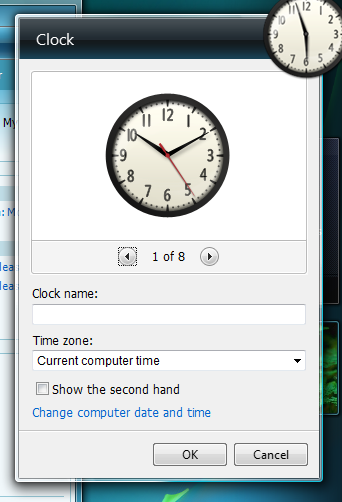 In the small pop-up box, click on the left or right arrow to select a different look for your clock. After you are satisfied with the appearance, click ‘OK’. Update – A very loyal reader “Royds” has made a tutorial on how to use your own custom image for the sidebar clock. Download the guide here.